WOAH ! What happened to map 27 ? Some maps are only released as Patreon exclusive content. If you like my maps and would like to have access to all my creations. Consider joining our boat, backing me financially. You will get access to all the material in Hi-Def version. In the darkest depths of the underdark, the drow priestesses reign among everyone else. Drow social structures place women and priestesses above the inferior male. It is them who hold the most advantageous positions. 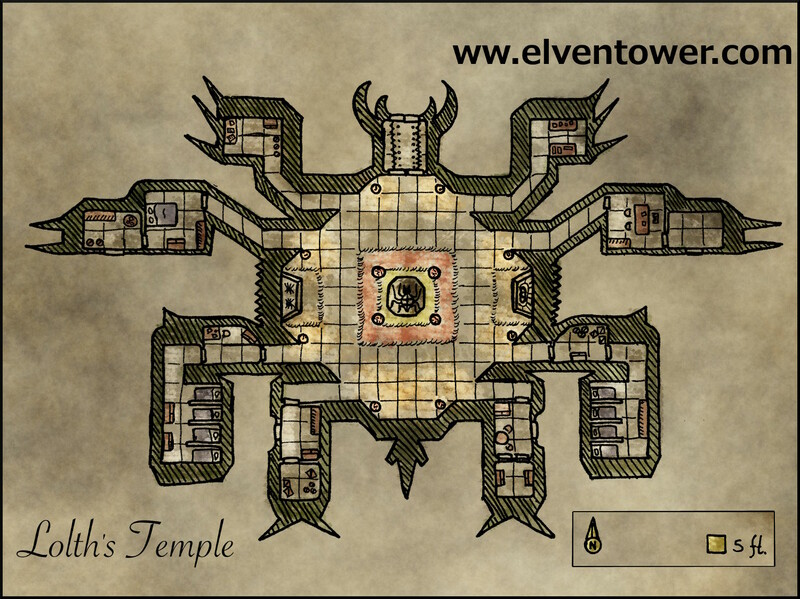 This a temple to Lolth, the spider queen, mother of drow. Few will dare approach such a place. The temple is built from dark stone, similar to obsidian. From the outside, the building appears to be a gargantuan spider in threatening pose. The main entrance to the church is through the giant spider’s mouth. There are four other exits in the building, in the “feet” of the giant spider. In the main hall of this church, failed drow warriors are brought to be sacrificed in the name of Lolth. After their sacrificial ritual, the poor souls of these drow outcasts are transformed into one the vilest creatures: the driders. Half spider, half drow, these misfits of drow society are the most hated among drow. Adventurers could want to rob the temple or a precious relic which is hidden inside. Or maybe they were captured by drow and brought here to be sacrificed in the name of the queen of spiders. This kind of encounter is better suited for a mid-level party (around 7-10). Excellent suggestions for foes and enemies are all kinds of drow, drow priestesses, driders and giant spiders. Depending on the adventure’s theme, a dose of demonic creatures is a good addition too.